WHEN IT WAS BUILT in 1885, this pont levant, or lifting bridge, was at the cutting edge of technology. 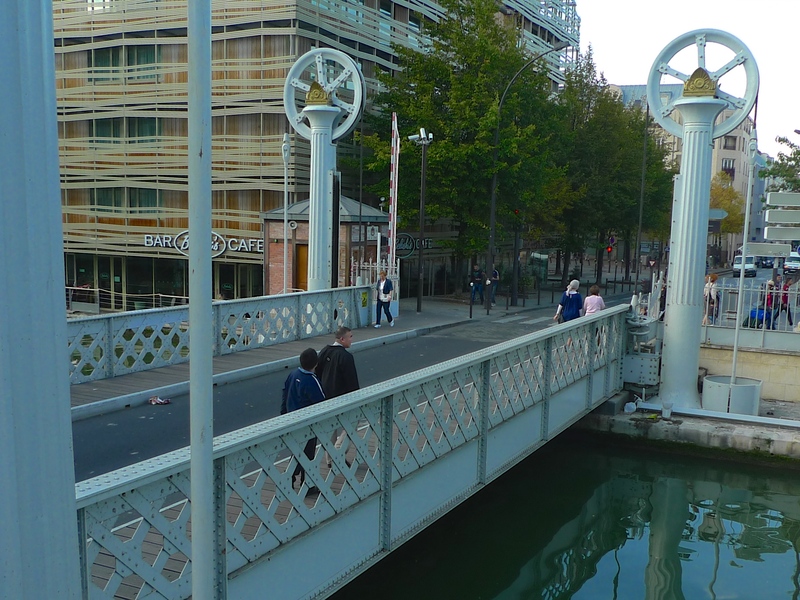 With its mechanism hidden in the sewers below and using pressurised water from the Paris drinking water system to power it, this was the first hydraulically operated bridge in Paris. 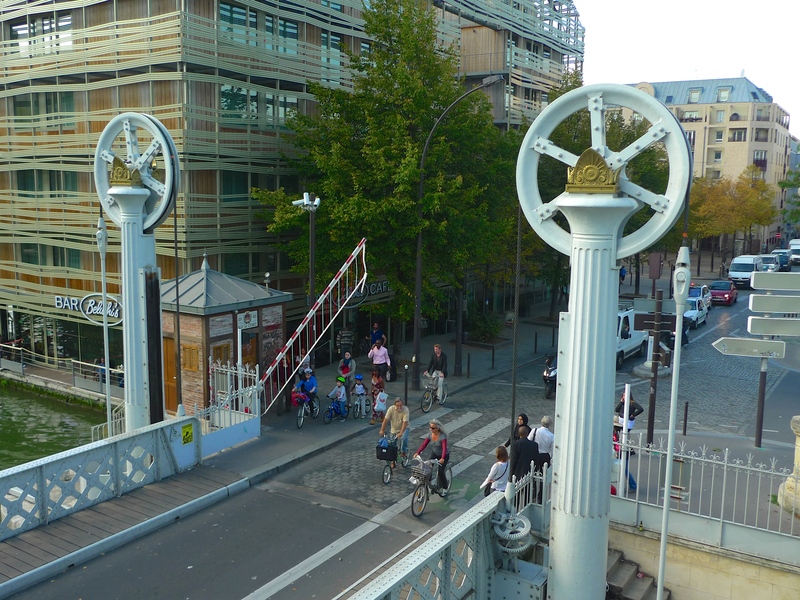 The Pont Levant de la Rue de Crimée crosses the junction of the Canal de l’Ourcq and the Bassin de la Villette in the 19th arrondissement and it’s the fifth bridge to stand here. 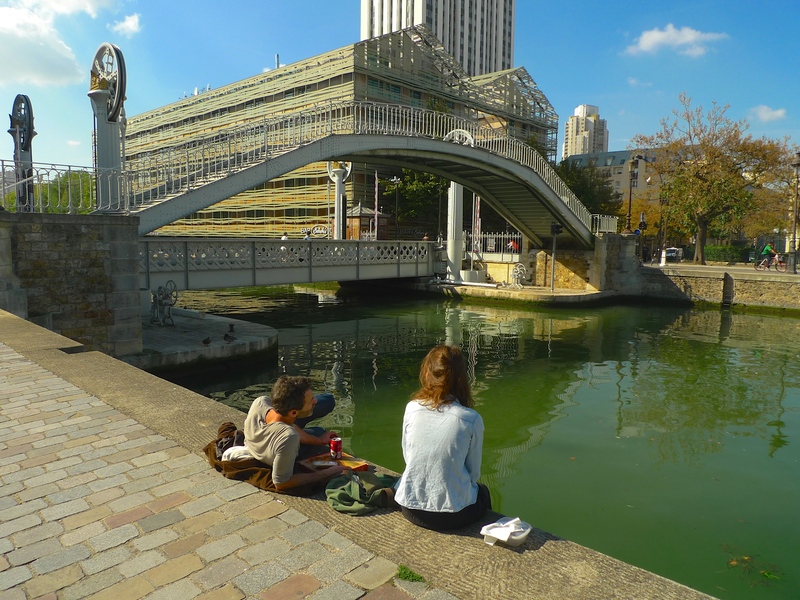 The first bridge was built in 1808 upon the completion of the Bassin de la Villette and it was a wooden pont à double bascule, a double-leaf bridge with a deck composed of two spans joining each other in the middle of the bridge and pivoting around a vertical axle at each abutment. During the Second Empire this bridge was replaced with another wooden bridge, this time a drawbridge. 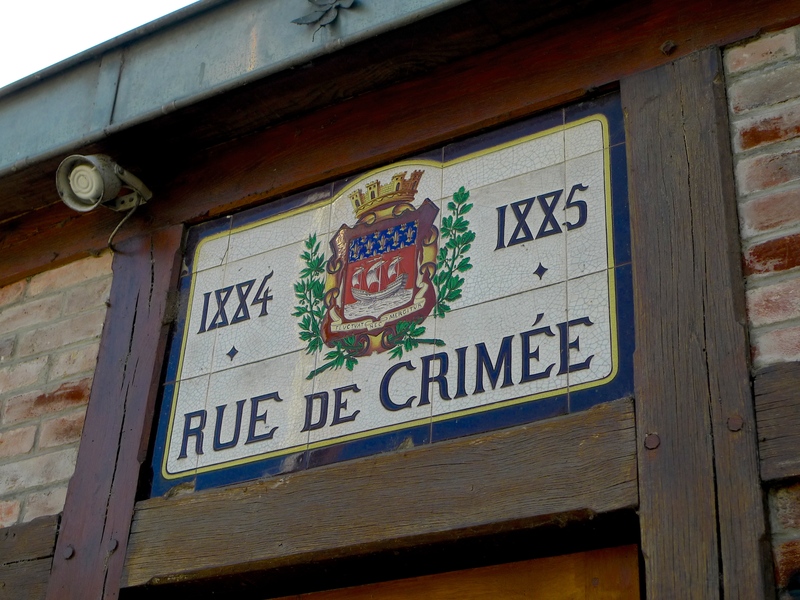 The third bridge, also in wood came to an ignominious end when it, together with two of the warehouses alongside it belonging to the Entrepôts et Magasins Généraux de Paris, were burnt down during the Paris Commune of 1871. This bridge was replaced by a pont tournant, a metal swing bridge. 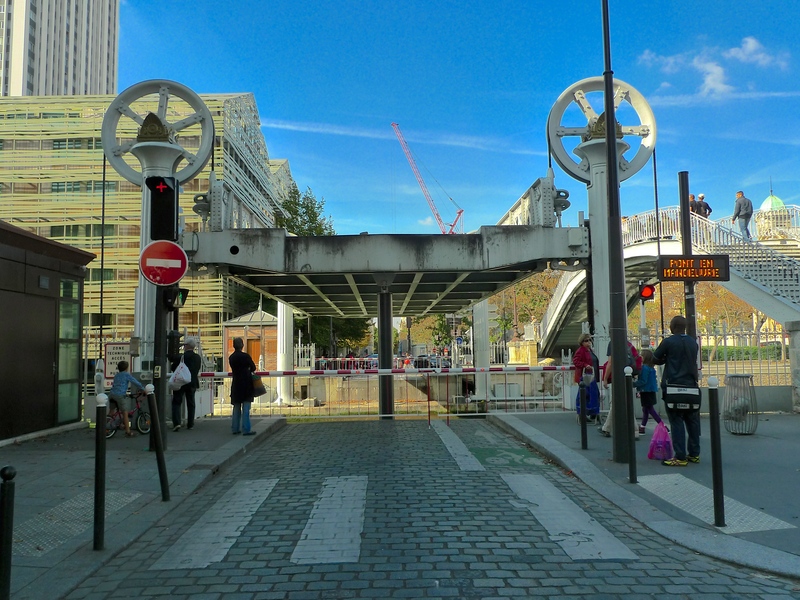 Some twelve years later, the creation of a new road, rue de Crimée, together with the widening of the channel connecting the Canal de l’Ourcq and the Bassin de la Villette, meant that the swing bridge had to be replaced and the option of a lifting bridge was adopted. This is the bridge we see today and it was opened on 2nd August, 1885. This bridge worked continuously from 1885 until 2010 by which time it was beginning to show its age. Towards the end of 2010, the bridge was temporarily closed for a much-needed makeover to make it more economical to operate, more environmentally friendly and safer. The steel deck was suffering from corrosion so it was replaced. The hydraulic system, which was buried in the sewers and had leather joints that were constantly leaking, was modernised so that it no longer depended on the Paris drinking water system for its operation. 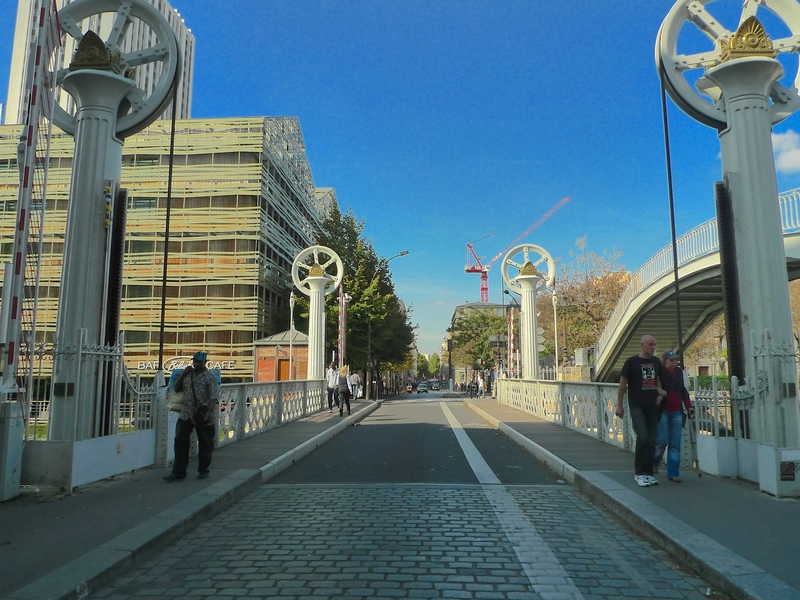 The moving parts of the bridge were completely refurbished, the sidewalks widened and a cycle lane was incorporated. Great pains were taken though to ensure that modernising the bridge didn’t detract from its historical significance, it is after all an official monument historique. 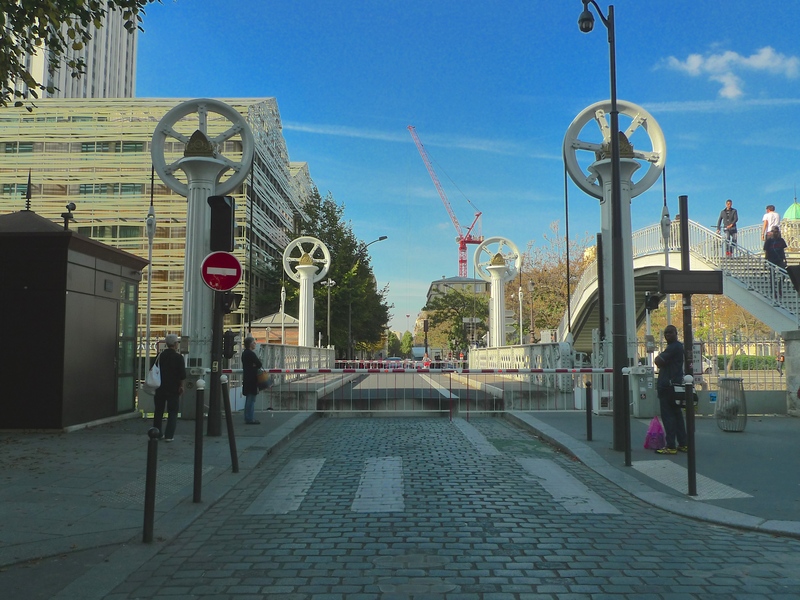 I went to the Pont Levant de la Rue de Crimée to see and listen to it in action. 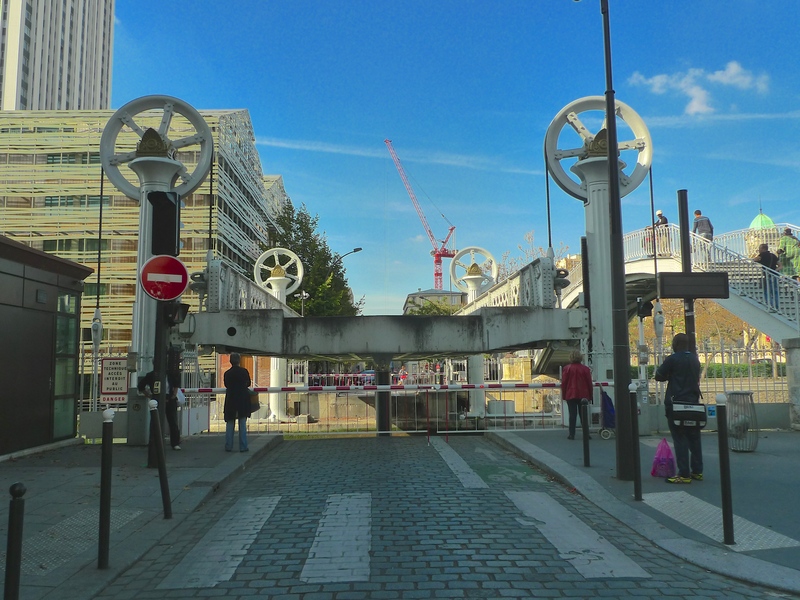 The movement of this bridge is controlled remotely from the control room of L’Ecluse du Pont de Flandre, the first lock on the Canal Saint-Denis, which is a considerable distance away and completely out of sight of the bridge. 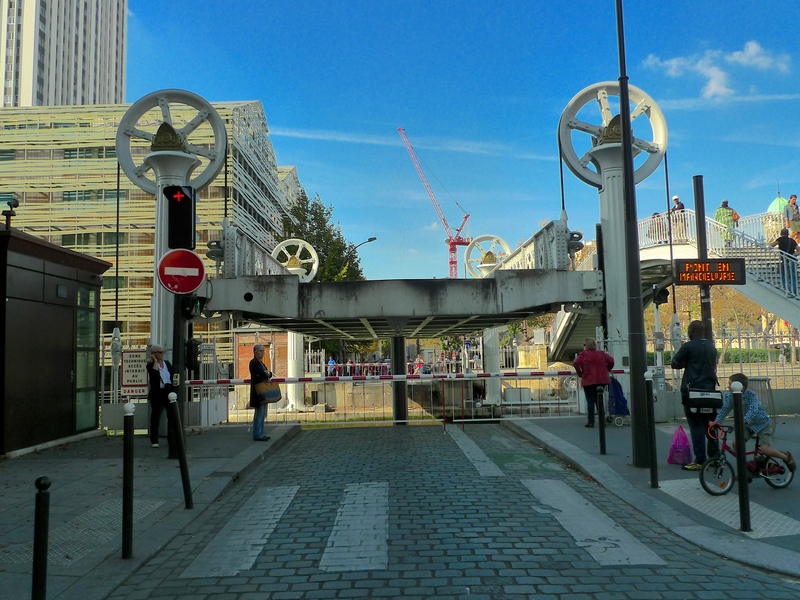 The first indication that the bridge is about to embark upon a lifting cycle is when the signs at each end of the bridge indicate ‘Pont en Manoeuvre’. A beeping sound then indicates that the two arms of each gate at either side of the bridge are about to close. 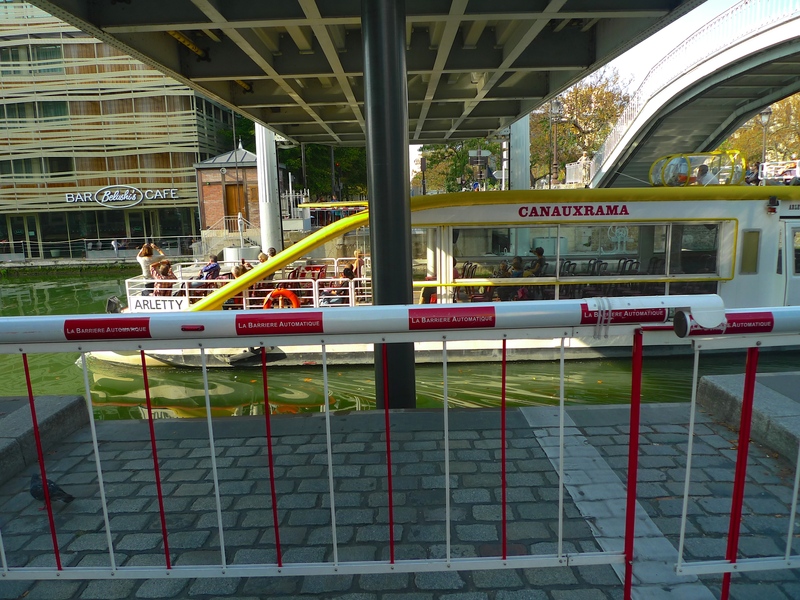 The gates close one arm at a time so that those caught on the bridge have time to escape before the lifting cycle begins. Once the bridge is clear of traffic and pedestrians and the gates are closed, a gentle thudding sound is heard as the bridge separates from the roadway and begins it journey upwards. 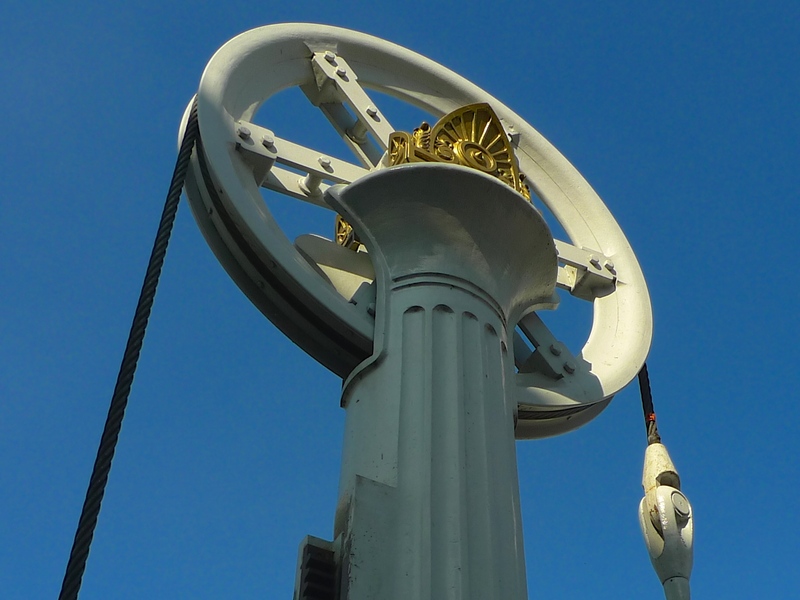 Since the overhaul of the hydraulic system the operation of the bridge is very smooth. Two hydraulic rams, one under each end of the bridge, push it upwards and then lower it once the lift is completed. Four metal cables gliding over the wheels mounted on iron pillars above the bridge, two at each end, help to support the bridge during the cycle. There are no spectacular sounds from the bridge itself during the cycle, just a slight groan as it begins to lift, a gentle purring of the hydraulics during the lift, a gentle thud as it begins its descent, more purring as it comes back down and a final sigh of relief as it nestles back into position joining the roadway. 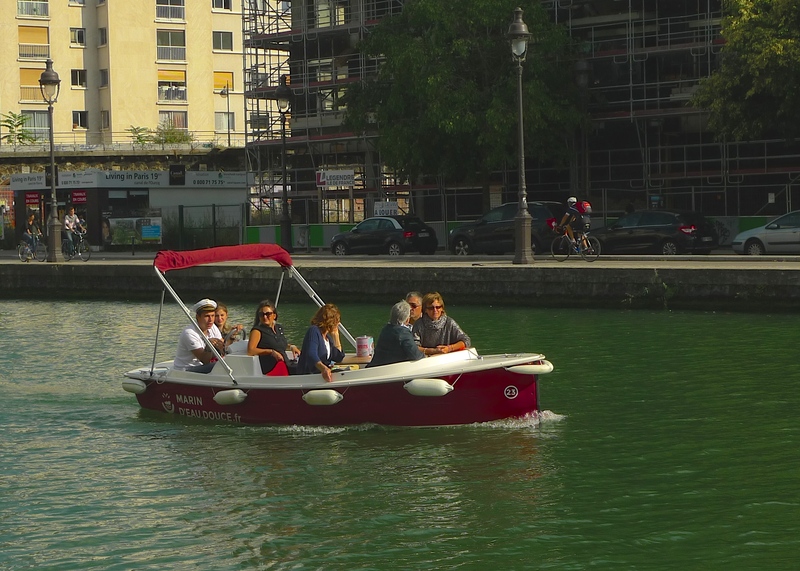 And, of course, the reason for all this is to allow the canal traffic to pass to and from the Bassin de la Villette. 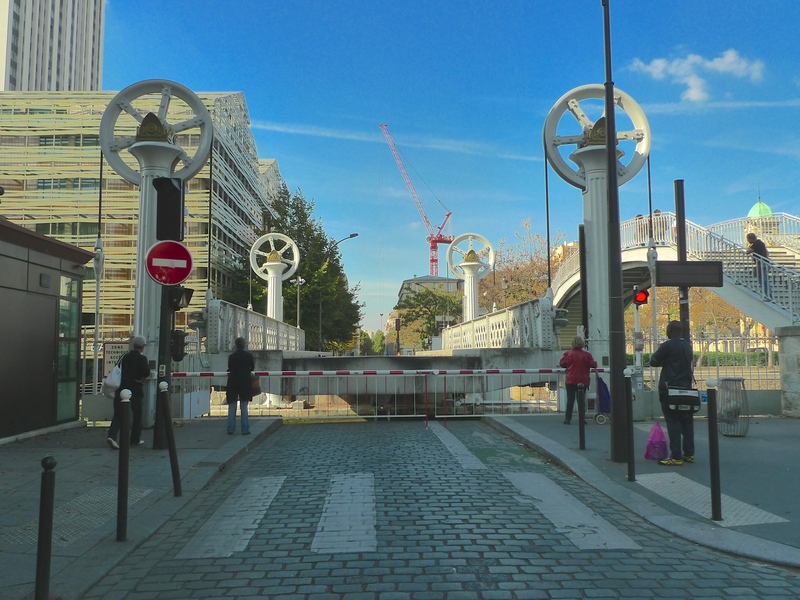 Once the canal traffic has passed the bridge is lowered and locked into place, the gates open and the pedestrians, the cyclists and the traffic can resume their passage along Rue de Crimée. I think there’s something really fascinating about bridges that actually move and so I stayed around to watch and listen to this one manoeuvre through several more of the 9,000 or so lifting cycles it completes every year.